A popular law enforcement cartridge, this .40 S&W load from Winchester fires a 180-grain jacketed hollow point bullet at 1025 feet per second. 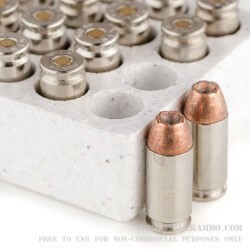 Each round in this box of 20 uses Boxer-primed brass cases with nickel plating for enhanced corrosion resistance. 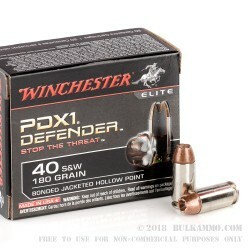 Winchester’s PDX1 hollow point ammo became the official load for FBI and Border Patrol agents in 2011. This bonded-core round is designed to offer superb six-petal expansion while effectively penetrating various types of light cover such as heavy clothing and sheet metal. 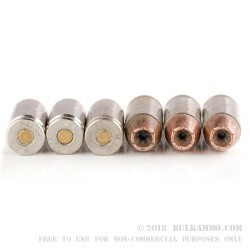 PDX1 bullets use a reverse-tapered bullet to achieve stronger penetration. Noting instances of core-jacket separation on contact with brittle but hard surfaces such as glass, Winchester designed a proprietary bonding mechanism that welds the copper jacket to the lead core and imbues the round with greater reliability. Winchester, a longtime division of the Olin conglomerate, was founded in 1855 as the Winchester Repeating Arms Company. Although Winchester branded guns are now made by FN and Browning, the company remains a major force in the shooting industry with highly regarded ammunition lines such as Silvertip, Ranger, and PDX1. 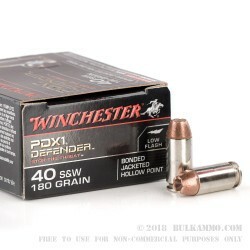 Winchester ammo is a very popular choice among law enforcement agencies including SWAT teams and the FBI.